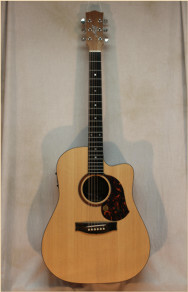 Hand made in Australia, Maton guitars feature incredible quality all solid wood construction. The SRS70C has a solid "A" Sitka Spruce top, solid Australian Blackwood back and sides, a satin finish, and the fantastic sounding AP5 Pro pickup which uses both a piezo sensor and an internal microphone with separate volume controls for each. Includes a nice hard shell case and a custom setup by your friends at Steilberg String Instruments.